Hunted is a standalone novel that is a retelling of Beauty and the Beast. I've been in a retelling/YA Fantasy mood lately for some reason so I'm just rolling with it. This one was an interesting take of the story we all know and love and I'm glad I gave this a try. We start off meeting Yeva (aka Beauty) when her father loses almost everything and he takes her and her sisters to live in a hunting cabin in the woods. Her father goes out for days on end to hunt and it's taking a toll on his mind so Yeva keeps the family together and brings back food and just keeps everyone alive while he's gone. After the father is gone a bit too long Yeva ventures out to find him fearing for the worst. She winds up getting captured by the Beast and with each passing day they grow closer and understanding one another, but not without some secrets. Some secrets are revealed and Yeva winds up going home only to find so much has changed with their lives. She can't get the Beast and his curse off her mind though so in an attempt to give him a happily ever after, she goes back to try to break the curse. 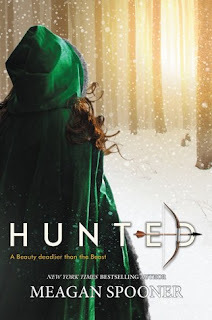 Hunted is a retelling that I'm so glad I grabbed in audiobook format. It was a fast listen that kept me intrigued with the unique twists the author added on the story. There were a few obvious things that took Yeva awhile to figure out when it was clear to me what would happen so that frustrated me a tad but overall I really enjoyed this book. I'll have to check out some of MSpooner's other novels when I'm back in the YA mood. If you're a fan of Beauty and the Beast retellings + YA give this one a try.